This long downward trend in the inventory-to-sales ratio has recently and dramatically reversed. What happened? As we noted in an earlier post, companies are often slow to respond to lower sales, waiting to cut production and/or reduce purchases. 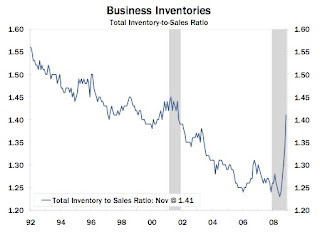 As managements "catch up" to the current sales reality (or as sales improve), we would expect the inventory-to-sales ratio to return to normal, lower, levels (with the associated benefits for corporate cash flow). The 2007 year-end selling season was not good for the home furnishings retailer "Linens 'n Things." Quarterly sales were up 0.6%, but only because the company opened four new stores. Ignoring the new stores, same store sales were down 1.0% for the quarter and 3.4% for the full year 2007. Even worse, margins were hurt by the "highly promotional environment" and increased marketing spending: quarterly gross margin declined from 36.7% to 33.8% and operating margin (adjusted for non-recurring items) turned negative. Cash is King: What About Liquidity? The news was not all bad. For the quarter, adjusted EBITDA was $15.3 million and cash from operating activities was $137.9 million (the large difference between EBITDA and cash flow was the result of the normal year-end sell-through of inventory). Standard liquidity measures looked good at year-end: the current ratio was 1.9x (about the same as the prior year-end) and it had excess availability under its asset-based revolving credit facility of over $300 million. The sales decline accelerated in the first quarter of 2008 and the company responded with an aggressive cost cutting plan. In an effort to conserve cash, the company also began to aggressively manage working capital: it slowed purchases to reduce inventory levels and it began to slow pay some of its vendors. This strategy backfired. 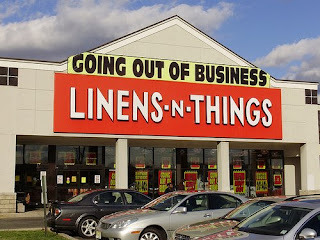 By late March, many vendors stopped shipping to Linens 'n Things, citing slow pay and even no pay on outstanding invoices. By mid-April, the company had begun paying cash before delivery to certain key vendors in order to obtain goods. This cash drain was unsustainable. In the four months from year-end 2007 until its bankruptcy filing on May 2, 2008, the company's use of credit (i.e. revolver borrowings and letters of credit) increased by over $170 million, a burn rate of over $42 million per month. This situation highlights the importance in credit analysis of of looking at a company's confidence sensitive cash flows. This refers to funding (or other cash flow) which depends on a third party's willingness to accept the company's (typically unsecured) credit risk. 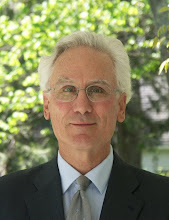 Examples of confidence sensitive cash flows include short-term borrowings (such as commercial paper), counterparty risk, and (as in the case of Linens 'n Things) trade credit. As we move further into recession, we often see a pattern in corporate free cash flow (defined here as cash from operating activities minus capital expenditures and dividends). A company's ability to manage cash flow as sales decline is a key determinant of credit quality and an important way to judge management effectiveness. Phase 1: Denial. Sales begin to decline, but management is unclear if it is temporary or the sign of a longer term trend. Optimistic management teams (and those without real-time sales data) do not cut production or purchasing, so inventory balloons in the face of declining sales. Receivable days may also increase as customers struggle with their own cash flow problems. These increases in working capital push free cash flow negative, even as operating income and net income remain positive. Phase 2: Manage Working Capital. A good management team (with good financial reporting systems) will quickly recognize the cash flow drain and act to bring down working capital. Actions may include cutting production and/or purchases to reduce inventory, aggressively collecting receivables, and perhaps slowing payment on accounts payable. These actions can quickly generate significant amounts of cash, but can also hurt relationships with customers and suppliers. This chart shows the quarterly financial performance of a capital goods manufacturer in the 2001 recession (shaded). As expected, sales and operating income began to decline as the recession began. 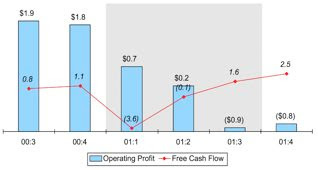 However, there was an immediate large drop in free cash flow (caused by a large increase in working capital) followed by an equally large increase in free cash flow (as management slowed production and worked down inventory). Phase 3: Cut Costs. As management recognizes the true nature of the sales decline, they will begin to cut costs in an attempt to maintain margins. This often means layoffs and pressure on suppliers. This should result in improvements to operating profit and cash flow a few months or quarters into the recession, depending on how quickly management recognizes the problems and moves to cut costs. Today, many companies are in this phase. Phase 4: Long-Term Restructuring. In some industries, the recession may signal a fundamental shift in demand dynamics - sales may take years to return to pre-recession levels (or may never get there). Companies in these industries must make changes beyond working capital management and short-term layoffs. This long-term restructuring typically involves permanent reductions in capacity, including cuts in capital expenditures and asset sales. On the financial side, the dividend may be reduced or eliminated. These moves are especially painful for management (and often shareholders) who have been focussed on growth. However, if management does not recognize and respond to these trends, the long-term viability of the company is threatened. The chart above for the capital goods manufacturer shows positive free cash flow (and an improving free cash flow trend) even as operating profit remained negative. The improvement in free cash flow resulted from aggressive cost cuts, asset sales, working capital management, cuts in capital expenditures, and a significant cut in the dividend rate. While painful, these actions by management ensured that the company survived the recession.